The best treatment for chronic pain isn’t found in a doctor’s office or pharmacy-it’s in the therapist’s office. Written by a mental health professional and a physician with over fifty years combined experience, this skills manual will teach you how to treat pain without pills and with confidence, using cutting-edge assessments, insights and interventions. Martha Teater, MA, LMFT, LCAS, LPC, is a Diplomate with the Academy for Cognitive Therapy and is a practicing cognitive-behavioral therapist. She has maintained a private practice for over 25 years. She has worked in primary care settings, free clinics, and medication-assisted treatment programs. Martha is well known for her work as a disaster mental health manager with the American Red Cross, and has been on many national disaster deployments where she provides support to traumatized people. A prolific writer, Martha has published over 175 articles in newspapers and magazines, including Psychotherapy Networker and Family Therapy Magazine. Martha is the coauthor (with John Ludgate) of Overcoming Compassion Fatigue: A Practical Resilience Workbook. 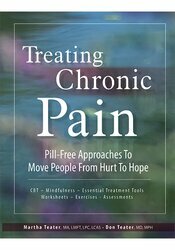 She is also coauthor (with Don Teater) of Treating Chronic Pain: Pill-Free Approaches to Move People From Hurt to Hope (PESI, 2017). Don Teater, MD, MPH, is a family physician who has lived and worked in western North Carolina since 1988. Dr. Teater works entirely with patients who have addiction and mental health disorders, and is a national expert in the areas of pain, addiction, and opioids. He has several years’ experience working with the Centers for Disease Control, the National Safety Council, and many other state and federal agencies and community organizations on the opioid issue.